8.05 points at 22 votes (rank 74). A favourite activity of many software companies was the conversion of arcade machine games to home computers. Datasoft managed to do this very professionally with Mr.Do!, quasi 1:1. In Mr.Do! you steer a small clown (according to the cover it looks more like the reaper man) armed with a ball through the aisles and shoot the hunters that follow you. 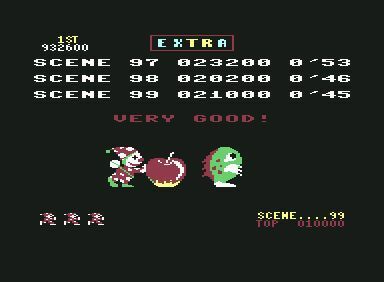 The aim of the game is to either "neutralise" all enemies or collect all cherries so that you can proceed one round (scene). 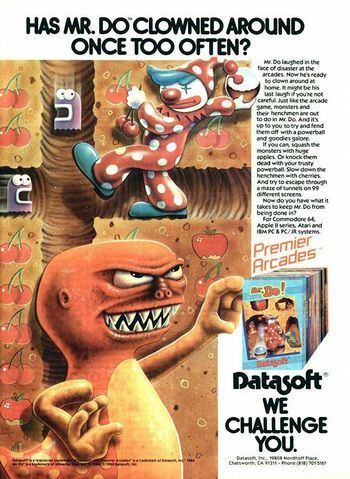 A very similar game was released by Mastertronic for the C16 named "Tutti Frutti". The game presents itself - similar to "Dig Dug" - on a screen-filling game area, there is no scrolling. The whole game is a mixture of arcade, skill, action and also strategy is not missed out. Because if you randomly dig holes into the walls, the enemies will have a walk-over as they mercilessly follow you. The clown can also drill through walls e.g. to cut the enemies off. He can also let apples drop onto the enemies (according to the "Boulder Dash" principle), this gets you more points than shooting them. The enemies emerge from a kind of gate. When enough enemies have emerged, the gate turns into a bonus object. If you collect this, suddenly three Pac-Man ghosts and one bonus enemy carrying the letter E, X, T, R or A appear. This also gets you many points. The E, X, T, R or A guy planlessly changes between the five letters and then also appears out of a sudden in the game. If you hit him with the ball, the letter that the guy carried at the moment turns yellow at the upper border of the screen. When all five EXTRA letters at the upper border are yellow you will get an extra life, which you will quasi need all the time. Concerning the apples you should watch out that if you stand below them, you should not move or it could happen that the apple (probably weighing tons) buries you. Bugs in the game: when going over a score of 999.999 points you will go on with 0 points. If you manage to make scene 99, you will go on in scene 00, then you start again at 01. Tayo has provided us with the image concerning this overrun bug. It looks funny: 0 points in scene 05. This is actually scene 105 with 2.000.000 points. This bug was fixed in the version by "Remember" (after scene 99 follows scene 01, the score "gets stuck" at 999.999). Mr.Do follows the joystick movements. By pressing the fire button you fire the powerball. If you always work towards the next EXTRA life, you can practically play endlessly. You simply have to take care that the blue 'creature" is at the correct letter when you collect the bonus symbol in the centre. Sledgie: "I did not know Mr. Do! until now. It is a really fun arcade game. Somehow a bit into the direction of DigDug and PacMan, as well as Bubble Bobble. It gets a full 8 from me." Z-Mat: "As with Sledgie, I do not know this game for long either. What fascinates me is the simplicitiy of the game and it is nevertheless very exciting. You are constantly occupied with either making an offensive or a defensive approach. I like this. I also give 8 points. " 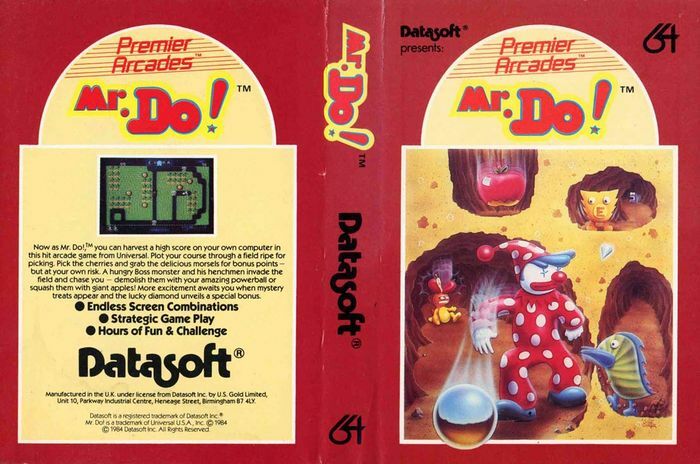 Mr. Do in the Killer List Of Videogames. This page was last modified on 18 September 2017, at 12:12.